This waterfall located on the Roaring Fork Motor Nature Trail is a popular destination and notable mostly because one can walk behind the waterfall. Kids love it because of that. It is a nice waterfall but nothing spectacular, having a small watershed and only a 25' drop. The waterfall ratings are average as a result. It is a good hike for the family if you want something easier than a stroll but not so hard that your wife swears off hiking with you. As a bonus there is a picturesque cascade just before you reach the main falls. 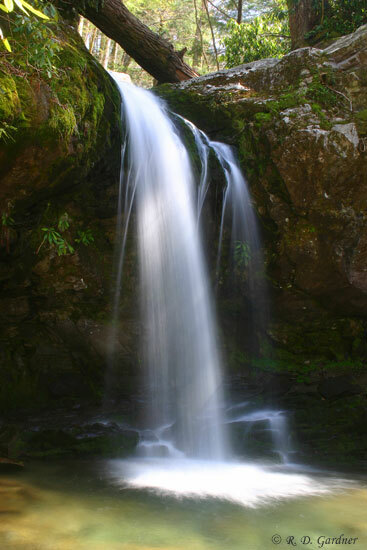 I'm calling it Lower Grotto Falls and I've posted a picture of it to the left. The hiking trail is located on the Roaring Fork Motor Nature Trail just out of Gatlinburg, TN. Parking is 1.5 miles past the first trailhead for Baskins Falls (more detailed directions here) or 1.7 miles past the official beginning of the motor nature trail. The hike is on the Trillium Gap Trail. Official park information lists the hike at 2.6 miles roundtrip while my topographic software shows 2.8 miles. Anyway, it's not a bad hike with a total elevation gain around 600 feet. 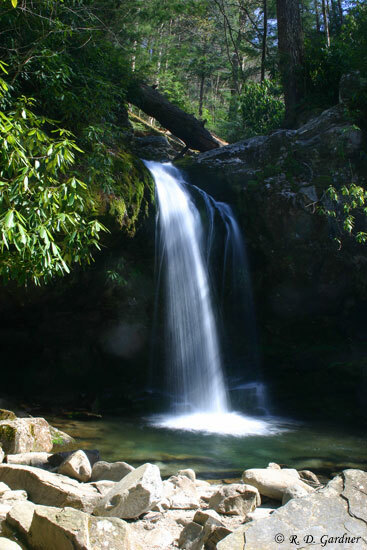 To see more detail on the hike, check out the Grotto Falls hike topo. A polarizing filter will definitely help here and a neutral density filter would be a nice addition as well to help slow the shutter speed. Water flow is not high so I recommend a small aperture setting (high f-stop) and slow film speed to assist with obtaining a long shutter speed. Having said that, a tripod is a must for a decent picture of the falls. The picture above had a 2 second exposure and I would have preferred about a 6-10 second exposure. From a composition standpoint, the left or left-center worked best for me. Be patient and wait for people to get out of the picture. Rocks are about the only foreground option. You will be close to the falls so a wide angle zoom or standard lens should take care of most potential compositions.